Charles was the brother of Emperor Francis - just like John. per se an "Archduke" is not more important that a Duke itself... it must always be viewed in context. Ron not 100 percent true. We have a university called Duke and then many sing about the "Duke of Earl" plus there are those who revere the show "Dukes of Hazzard"
Clearly a 10th Amendment issue. It reminds me of a 1961 California Supreme Court case where the justices found an attorney not liable for malpractice for misapplying the Rule Against Perpetuities -- because the law is so complex even lawyers can not be expected to understand it. Now for the important question. What's the pecking order among the different titles, i.e. barons, dukes, earls and viscounts. Are earls bigger cheeses than barons? And how many dukes equal a viscount? We're dealing with some really heavy stuff here. Of course as Pat pointed out, over here, we've covered two of those possibilities with our own duke of earl. And did Duke Ellington outrank Count Basie? "I heard it started when some fella called Archie Duke shot an ostrich 'cos he was hungry." For what it's worth, I fired up today's scenario again this evening in MP, set my officer to one of the Austrian battery captains, and walked away for 3+ hours. The AI played itself through to the end with the same settings we used earlier. The scenario ran perfectly fine to conclusion -- no problem at all. As a result, it seems likely that our crash and other game-terminating bugs relate to how our human players interact with or strain the system. Which points to an obvious solution: don't let humans play. Kevin, Roland and I talked for a while about this after the game yesterday and it is possible human players inadvertently hit the wrong buttons on the toolbar which could confuse the system. Its a MyGUI problem at the root of it - the toolbar Kevin built is the best we can hope for under this interface but without the ability to have the correct button menu become displayed when you select an officer of a certain branch (inf/cav/art) we get these inadvertent button presses. If it is this there is no fix other than a much simpler toolbar without the army branch tabs or lobbying NSD to ditch MyGUI. I think it is time the KS group opened a thread in the MP section at the NSD forums and highlighted the MP issues we have been encountering. As others have said, our group is possibly the single biggest MP group out there; the lobby is almost a ghost town when we are not around so our views ought to carry some weight. We could also ask Connor and Little Powell to play some MP games with us. It is doubly frustrating that previous frequent KS players like Mitra, Steve and Stefan don't - play with us anymore. If they did I am sure our concerns would reach Norb's ears faster. Inviting Mitra to play with us is another option. But I think we have to get this issue to Norb's attention as a matter of urgency. I knew it. My pressing "m" and looking at the map to find out where I am is bad for the game. From here on out I shall use The Force. you didn't show up for your duel this morning.... I shall have to deploy my entire brigade to track you down and let justice be done! I wonder if vanilla MP games will have the same crashes. We played a few pretty good sized vanilla games and didn't have any crashes when the game first came out. Herr Generalmajor, I am quite the honorable man, I will have you know. At least that is what I order my staff to tell me day in and day out and they do so most enthusiastically. I've only played a couple of vanilla games but they do seem to be stable, even with couriers. But the KS mod we used yesterday which gave us a bad frame error again had the ai.dll disabled, so all it was was a bunch of different sprites, plus a bunch of different logistics files - so essentially the exact same stuff we had in the Gettysburg mod - and that very very rarely had the bad frame error. If that can be the cause of the problem. I am the guiltiest player in history, I have used the inf/cav/art tabs once or twice with the WLL game, I always use the default one, that's for infantry. And yesterday I didn't have any infantry. on the stake with him!!! I blame the Chinese. Clearly hacking into the server to gain insight into the history of western civilization as part of their master plan. I am the guiltiest player in history, I have used the inf/cav/art tabs once or twice with the WLL game, I always use the default one, that's for infantry. Being serious now, this actually could be the problem. We just don't know at this stage. I've begun to get used to the tabs and tonight didn't make a wrong press except deliberately a few times to see if it made any difference. It didn't but if someone is doing it ALL the time, it might. Yesterday we played this battle as the French. 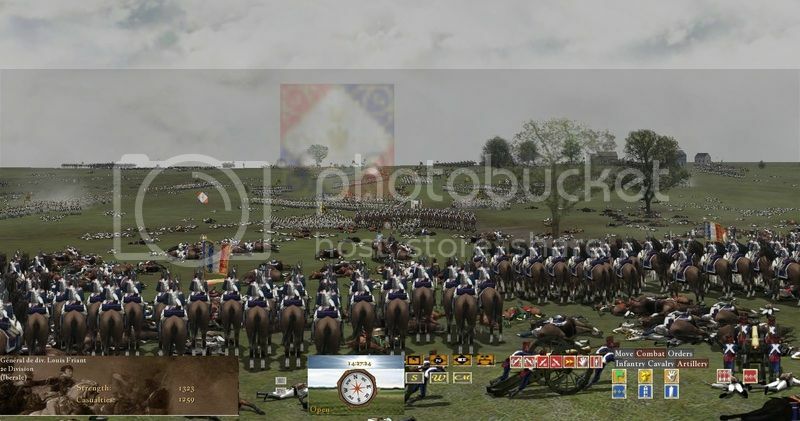 I was extremely busy with my cavalry division to take any screenshots, but was killed twice in the charge and countercharge business and returning to my troops the sight was so impressive I took this one. It played very well and I had not enjoyed so much with WL for a good while. Thanks to all and to Roland, the scenario designer. It was an epic cavalry encounter, a really bad place to be if you were in the infantry.